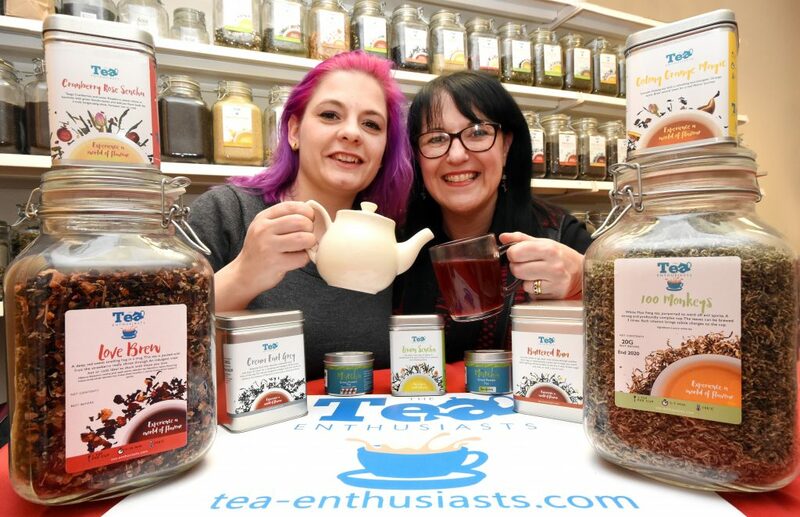 Photograph featuring (l-r) Liza Johnson from tea enthusiasts and Janice Ross, business advisor at North Tyneside Business Factory. Four generations of tea lovers from one family are brewing up exciting plans for a new business following a £25,000 business loan from Virgin StartUp and assistance from the North Tyneside Business Factory. Liza Johnson (38) is the founder of The Tea Enthusiasts, a new business selling a curated selection of teas from across the globe to customers in the UK. Tea Enthusiasts currently sells a wide range of loose leaf teas and accessories through a bespoke online platform that aims to service a range of domestic and trade customers interested in broadening their range of specialist and everyday teas. The business started trading in January 2018 and has quickly become a family affair, with Liza’s mother, daughter, son and even Nan all pitching in alongside a newly appointed 17 year old apprentice currently training as part of the warehouse and quality control team. Liza comments: “Tea has always been in my blood. My mother is a tea merchant and is almost never without a pouch of her favourite blend of tea to make sure doesn’t have to settle for an underwhelming cup. Her love of tea blends filtered down to me throughout my youth and I have always been able to make a fan of even the loudest voice of dissent when it comes to the taste of tea. Liza formerly worked in child protection as a social worker before undertaking self-employment with a joint comic-book shop and trading card company. However, the idea for tea enthusiasts really started to take shape in summer 2017 and Liza felt the time was right for a change. Liza worked with the North Tyneside Business Factory to develop a robust and detailed business plan designed to launch Tea Enthusiasts to an online marketplace. She was assigned a personal business advisor in the form of Janice Ross to advise on planning, premises and routes to market in addition to the more important aspects of financing the business launch. Virgin StartUp is delivered exclusively in the North East by Tedco Business Support and offers low-cost, government-backed business loans to new business ventures up to the value of £25,000.